When can I tour The Carter? How do I know which units are available? On our “Choose Your Home” page, any of the units you can view are currently available! If, for some reason, a specific unit is not available but is something you are interested in, let us know so that we can find you something comparable. How long does it take to receive approval of my application? Our screening company is fast and efficient. Typically, an application can be processed between 4 to 48 hours. Schedule a tour now! Wow, you are excited. And we love that! Our units will be ready for move-in soon, our construction crews are working hard to get the building ready! Schedule a tour to come by and view our model units and get your questions answered by our leasing staff. I’m not in town right now…how do I apply? We are here for you no matter where you reside – 24/7, 365 days a year. Contact us for more information. What do the units look like? Well, to start, they’re smart and modern. Common features include big windows, stainless steel appliances, polished concrete, wood or modern carpet floor coverings, and walk-in closets. Check out some pics we took. What types of floor plans are available? 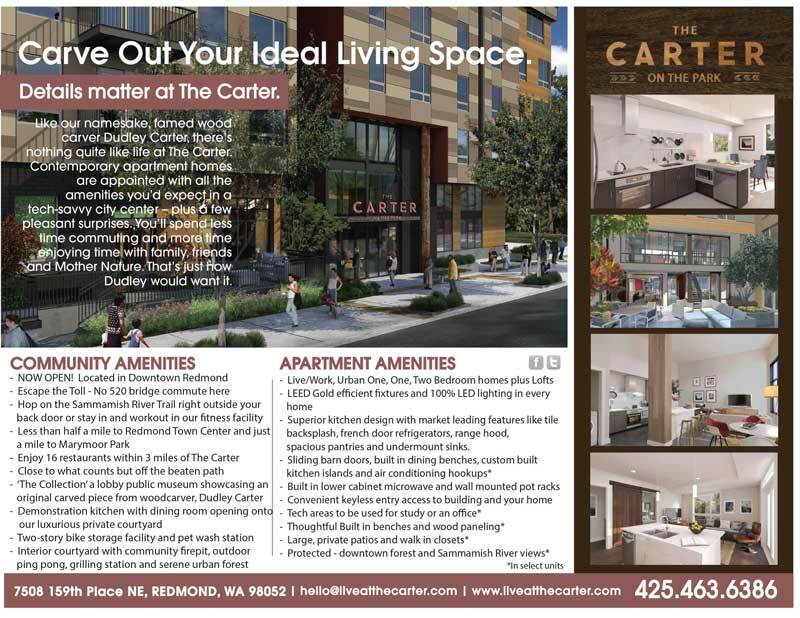 The Carter offers a variety of floor plans, including Open 1-bedrooms, spacious 2-bedrooms, and even panoramic loft living. We know everyone has different ideas about space and price, so we wanted to cover every base. Explore the options. What is an Urban 1-Bedroom? It’s like a studio apartment, but even better! An Open 1-Bedroom typically has 3 walls and a closet in the bedroom area but doesn’t have an actual door. The bedroom flows into the living areas, but you don’t have to sleep with your head next to the fridge like many studio apartments. It’s truly the best of both worlds. Do the apartments have washers and dryers? You betcha! No quarters here. Each apartment has its own full-size, energy-efficient washer and dryer. Yes. To school or work and back, parking is available in our easy-access underground garage! But don’t worry if you don’t have a car- The Carter is so close to public transit! Check out our map. Will there be bike storage? Absolutely and lots of it…we’re in the Bicycle Capital, so we have no excuse! You can choose from our bike racks or our secure bike lockers. And don’t worry, we even have an on-site bike repair area! What will the amenities include? What don’t we offer! Let us know how we can help you no matter what you need. Package delivery, dinner hot spot recommendations, dog walking service recommendations, free community wi-fi, monthly events for residents to mix and mingle and after hours emergency services – we’ve done it all and we don’t mind a bit. Check out our amenities. Absolutely, Fido is more than welcome. Cats and goldfish too. We just installed a new dog washing station for Fido! Check out all of our amenities here. Absolutely! Pay 24/7 through our online portal available to all residents. How do I schedule a maintenance request? Our resident portal, Active Building, was designed to mimic today’s social media websites. Once you become a Carter resident, you will be assigned an Active Building profile where you can easily schedule maintenance requests and keep in the know of the building. It’s pretty darn cool.